Memphis Sound 2005 program to be called ""One Hot Night""
From a Memphis Sound press release: Music heats up the night, as Memphis Sound presents an energetic fusion of jazz, funk, and Latin this season with a show entitled "One Hot Night," based on Los Endos Suite. A recent Memphis Sound rehearsal. Prepare to have your soul ignited with fast-paced drill, high-energy percussion, jazzy horn textures and ever-changing guard colors. In its third season, Memphis has developed a solid package guaranteed to become a crowd favorite. "Our show this season will be totally different from our debut production two years ago," said corps director Trey Moore. "As a young corps, we are still evolving musically and stylistically. We are working towards the Memphis sound and look that one will recognize when you see the corps. We're excited that this year's high-energy show will move us closer to establishing our roots." Returning for their third year with Memphis Sound are brass arranger Terry Jolley, and percussion arranger Kevin Tabb. Jolley is also serving in a new role this season as design coordinator. The Memphis Sound design team includes Kevin Tabb, percussion director; Alan Alexander, drill designer; Bobby Patrick, visual director; Alan Armstrong, brass director; Copper Atwood, guard designer; and director, and Trey Moore. The opening segment of "One Hot Night" was introduced to the corps at the rehearsal camp this past weekend. It was enthusiastically received by the 100 corps members and prospects in attendance. 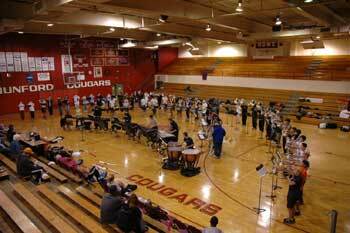 Brass, percussion and guard members all worked through the opening segment. Memphis Sound's next camp is scheduled for February 4-6, 2005.